The year 2006 marked a turning point for Owen Ashworth’s solo bedroom recording project, Casiotone for the Painfully Alone. After three albums of quaint indie pop played on inexpensive Casio keyboards, Ashworth decided it was time to evolve. 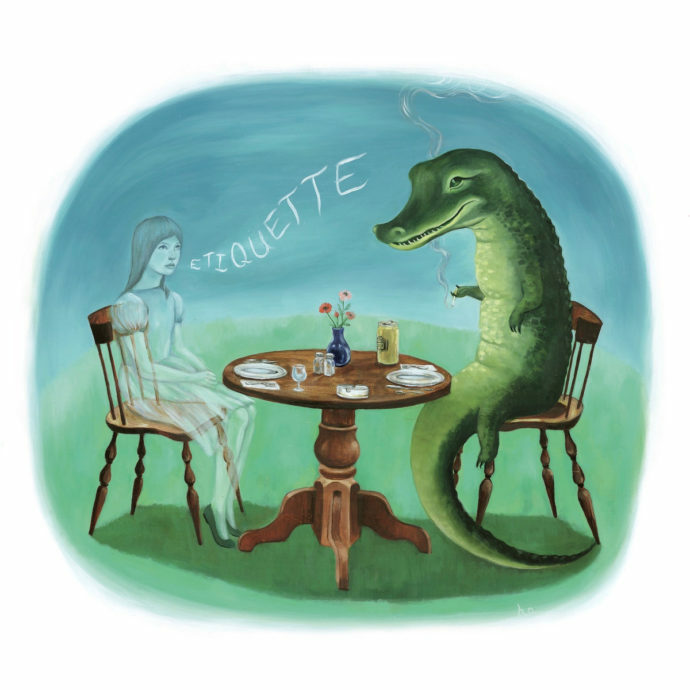 Incorporating not only analog instrumentation but additional musicians and surrogate vocalists, Etiquette was a sea change for CFTPA in terms of scope and broadened renown, becoming one of the project’s most beloved releases. The songs on Etiquette walk the listener through a year in the lives of the characters who inhabit Ashworth’s imaginative universe. “New Year’s Kiss” describes a woman waking up in a stranger’s bed and trying to remember the night before as she walks home. “I Love Creedence” tells the story of a boy who loses the companionship of a woman who was the only person besides his father to tell him she loves him. As we move through the year, each vignette is cleverly imbued with minutiae that fleshes out Ashworth’s lovable fictional cast and their environs. “The clasp broke at the disco, Mom, I’m sorry, and the older men who hit on Becky nearly broke their necks on scattered pearls,” Jenn Herbinson sings on the New Order-esque “Scattered Pearls.” The songs on Etiquette take on a variety of genres, including balladic jazz, country, and classic rock, but the album maintains a cohesion due to its synthpop heart and Owen’s affecting, character-driven lyrics. As if to ease fans into the transition from low-tech synths to strings, live percussion, and pedal steel guitars, the analog instrumentation on Etiquette is introduced temperately from track-to-track as the album progresses. The record’s halfway point is reached with a spoken word performance titled “Happy Mother’s Day.” Over gentle flutes, Sam Mickens tells a short story about his mother being “taken by fits of rage unlike anything she’d ever experienced in her fifty-seven years of life.” This short intermission of sorts simultaneously showcases Ashworth’s quirky sense of humor and resets the listener’s ears before moving into Etiquette’s more analog-heavy second half. Real drums are heard for the first time on “Holly Hobby (Version),” an earnest track sung lovingly by Dear Nora’s Katy Davidson with Owen providing backing vocals during the choruses. “Bobby Malone Moves Home” opens with a piano stealing back the opening chords to John Lennon’s “Imagine” from Oasis before live drums enter and Ashworth sings sympathetically about a boy who couldn’t make it on his own and has to crash on his parents’ couch. The ballad “Don’t They Have Payphones Wherever You Were Last Night” moves at a snail’s pace, signaling the record’s approaching end. Etiquette is concluded with a cover of Parenthetical Girls’ “Love Connection” as sung by Jenn Herbinson. Here Ashworth brings things full circle by returning to the Casio-sound he utilized initially. The newly remastered edition of Etiquette finds the album’s initial twelve tracks joined at the end by “White Corolla (Version)” and “White on White,” two songs which were only available previously on the singles and rarities collection, Advance Base Battery Life. Matthew Barnhart did an excellent job remastering this, the most popular and influential album in Casiotone for the Painfully Alone’s discography. Every song sounds more vibrant and clean than when they were first presented over a decade ago. Etiquette is a standout moment in the bedroom indie pop genre and an exceptional example of an artist evolving his sound without abandoning the uniquely original charms that make his work distinctive.